Micro1000 IR Laboratory Turbidimeter - Orlab Instruments Pvt. 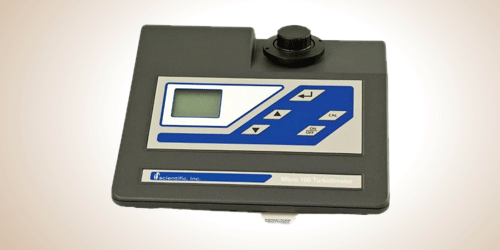 Ltd.
Extended Auto Ranging Up to 10,000 NTU: Instrument senses turbidity level of sample and automatically adjusts to the appropriate measurement range. Auto Alert Calibration Prompt: Automatically prompts the operator to initiate simple menu-driven calibration. Ratio (Color Correction): Automatic Compensation for background color. RS-232 Output: Date, time and NTU reading can be captured with a serial printer or data recorder. Reusable ProCal Calibration Standards: Quick and easy calibration across all ranges without the need to mix Formazin.